"I LOVE to be organized...but when I'm working on a project (several usually) it looks like a bomb went off. I should take a picture of it right now. Ughh". So Barb emailed me back and wanted to see it. So here it is! 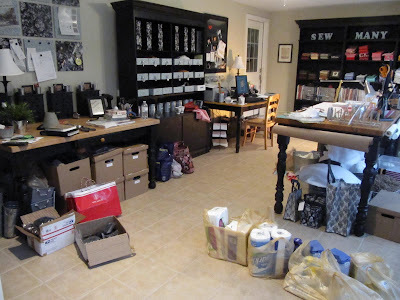 This first picture is when I showed everyone my new sewing room after the flood. first the floor...bags of supplies for a breakfast fundraiser for the school, boxes of buttons from my good friend Carol (I'm working on several project with these buttons to share with all of you), the red bag is filled with books I bought at a consignment shop, in front of the hutch is a bag of dog bones for a fundraiser (the school's mascot is a bulldog), the tote bag is filled with books that I read in the car on our college search trips and there's fabric on the floor too...you just can see it! on top of tables...books, lists, lamp shade for a project, frames etc. On my desk, I have a cup of tea and a cup of coffee going at the same time (what's up with that? !...I love my tea, but I wanted to finish the coffee from the pot I made for my husband this morning), I also have a paperwork project all over my desk to keep my blogging friends organized. the 2 little teacups on the center cabinet are the best consignment shop find. They are from my Christmas China by Nikko...Happy Holidays. I found those 2 for 69 cents each at Goodwill. The fabric next to that is from the clock project. There's more but you get the gist. Believe it or not, I do re organize once a week, once I clear out finished projects. For all of you that emailed me about the secret project for Jodi, I'm doing a post today. Wow, what a wonderful response from all of you...thanks so much!! I'm just waiting for my camera battery to recharge to take pictures of the blocks...so stay tuned for the details. My sewing room is so small that it doesn't take much out of place for it to look messy...and it usually always is messy!!! I'm thinking about doing a blog post about this soon, too. Even your "mess" is organized! Just yesterday I was looking through the pictures of your new and organized sewing room. Might be a bit messy but it's still quite organized. Would you come visit for a few days and organize mine, please? I told Barb if my room was neat, I would never find anything!! Glad to see you are just like us! LOL that is just the funniest! I told Barb she was being unrealistic, high expectations, etc, etc, in reality we just can't keep it clean when we are in the middle of creation! :D I just love the after pic as my new sewing room has never looked like day one!AND PROBABLY NEVER WILL AGAIN! You might want to check out my Blog! Thanks for keeping it real!! 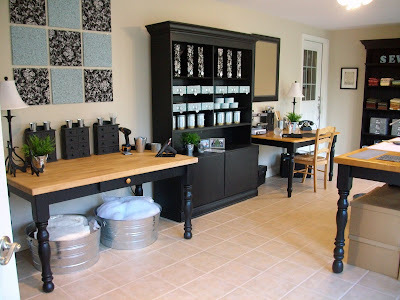 Love it and would love to work in your sewing room, it is awesome!! You made me smile. I love both versions of your room. I like my sewing room organized but I also like when I look around and see it all jumbled up...it means I've been busy and enjoying myself. Thanks for being "real". LOL! I'm only laughing because we can all relate. CLUE WHERE EVERYTHING IS NOW. Whew! I love the real photo, but it's still neater than mine! Even when everything has a place, it can't stay in its place and get creativity done, isn't that true? I love it both ways. I told Barb, I just feel better if I try to pick up between projects! I feel so much better now! Just last night my husband was standing at the threshold of my craft/guest room and I could just see the thoughts going through his mind ("Should I call that "Hoarders" show and see if they'll take her on?). He is Felix Unger personified and although he didn't say anything he wears his emotions on his sleeve (and face). Lol! I had a tool I wanted to pass along that I have found very useful in threading ribbon, elastic...anything. It is a hair tool called Topsy Tail. I don't have a picture of it but if you google it, it is a pink piece of plastic molded to thread your ponytail back through itself. I've made a pillowcase dress and was able to thread my ribbon through the casing super quick! It has a long "needle" so to speak so you can put gobs of material on it, or even safety pin the elastic/ribbon, etc to the loop. I hope you are able to use/pass on my little tip to all your readers.